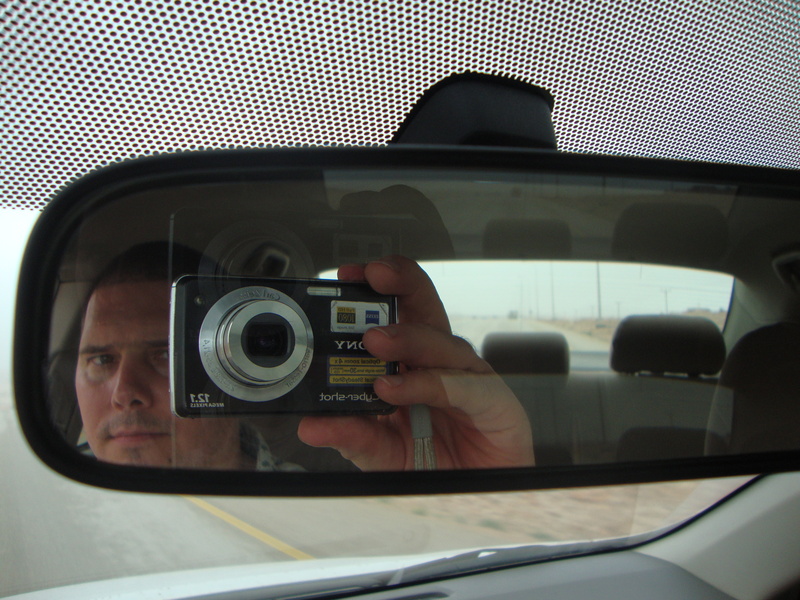 Speed Demons in Muscat, You’ve Been Warned! It seems that some people think the new expressway in Muscat (linking Al Naseem to Qurum) is a racetrack! I’m glad to see that the R.O.P. (Royal Omani Police) seem to think otherwise! That expressway was given to the people of Oman as part of the 40th anniversary celebrations in late 2010 and meant to take some of the traffic off Sultan Qaboos Street which was the only highway through Muscat until the opening of this fine highway. It was not meant for punks to “blow off some steam”! In local papers, the ROP posted the license plate numbers and speeds of people caught speeding on the expressway. NICE! (posted here on the left side in Arabic) In addition, they are supposed to be fined 500 RO and a year of jail time. We’re not talking about a few kilometres over the limit. (By the way, you can go 9 kms over the speed limit without setting off a radar in Oman.) The official speed limit for most of the distance on the expressway is 120 km/h. What kind of person drives 190 kms or more? I’ll tell you what kind. Idiotic. Selfish. Self-absorbed. Wordly. Reckless. Unfortunately, a lot of people like such attention and think it’s “cool” that they were clocked going at such speeds. There is a lot of smalltalk about whether the car doing 273 km/h was a Lamborghini or a Rolls Royce. It doesn’t matter what type of car he/she was driving. The point is what type of person was driving that car – a reckless one! I personally don’t find anything “cool” or “awesome” about people endangering the lives of others. Once again, way to go ROP!!! 🙂 To read more about the ROP’s crackdown on highway hoodlums, read this article in the Oman Observer. I guess the new song for the 21 offenders will be, “I fought the law and the law won“! 2 Thumbs Up for the Dhofar Police Presence! I wish I could show you a pic of the colorful Dhofar police/military uniforms with tinges of purple in army fatigue, but they are very adamant about not having their photo taken. 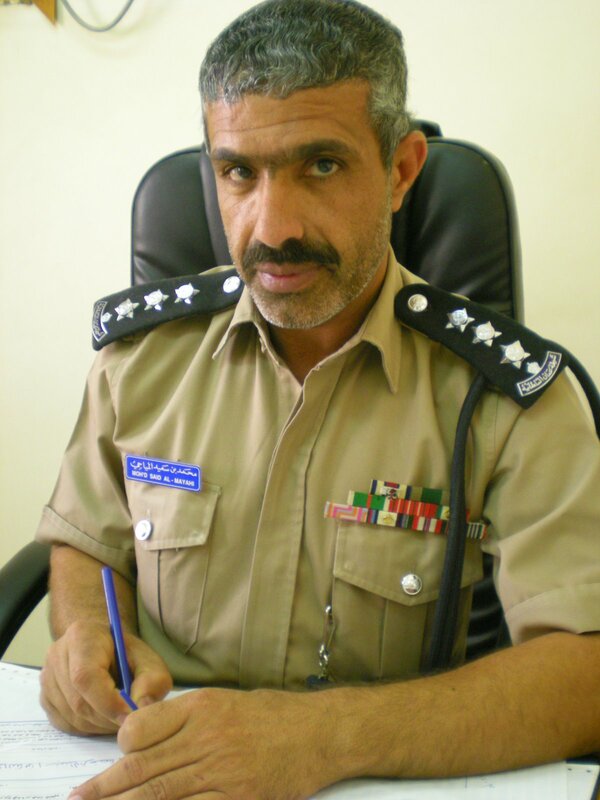 Have you ever tried googling “Dhofar police pics” in google images. Try it out! You won’t find much! 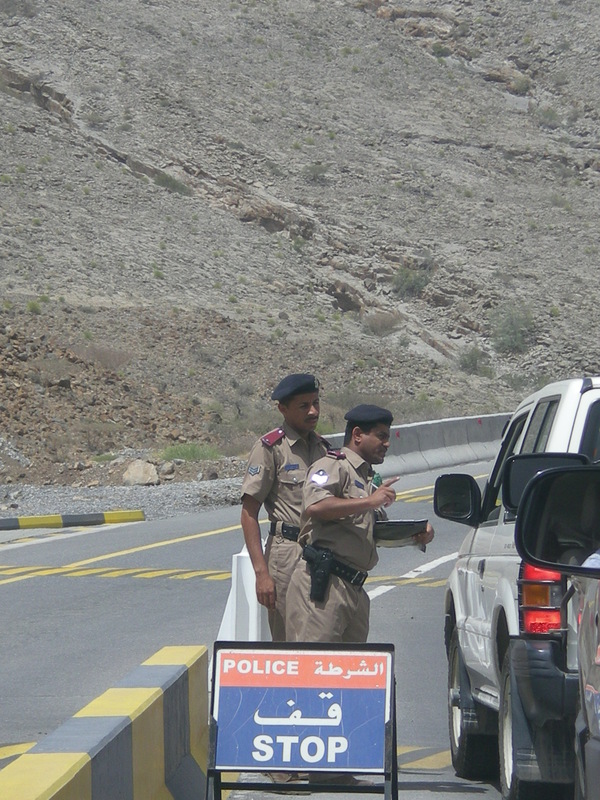 Interesting to note that when I searched “Omani police road check“, the 1st image on the list was one of mine on my trip to Jabel Akhdar! 🙂 To see some incredible pics of Omani police serving the public, check out this pdf file put out by Omanet! 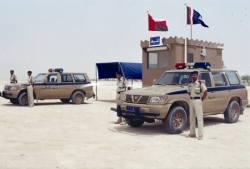 Anyway, it’s reassuring to know that the ROP are out in force doing their jobs effectively keeping Oman a very safe and stable country! R.O.P. 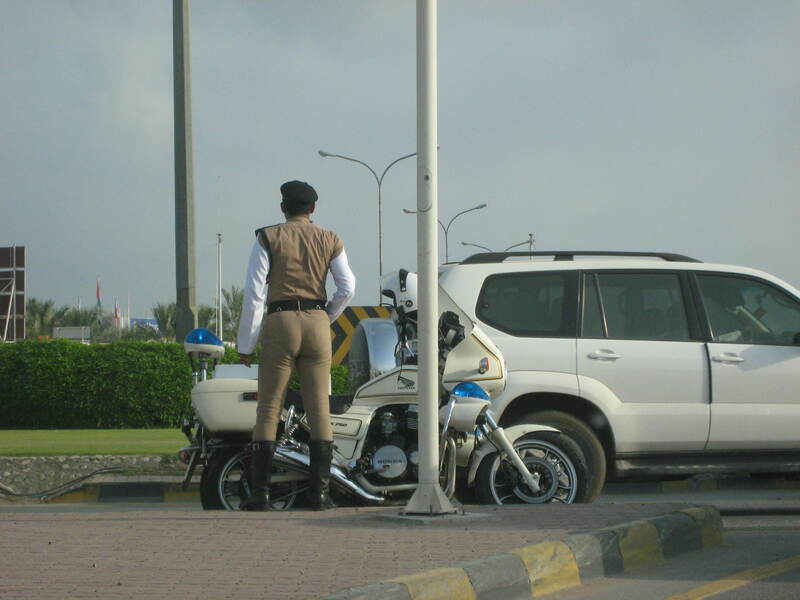 – Royal Omani Police or Really Overtight Pants?! You be the judge. The R.O.P. 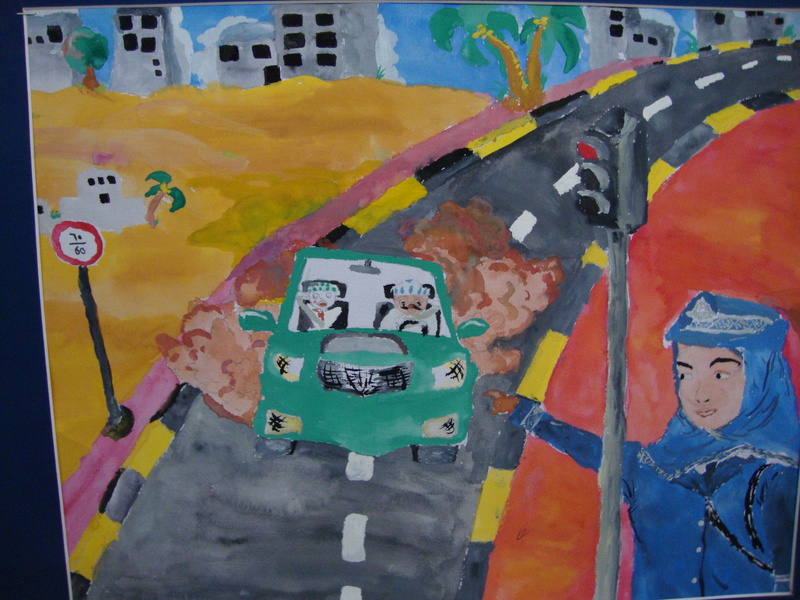 (Royal Oman Police http://www.rop.gov.om/), in conjunction with CityCentre and Oman LNG, are trying to educate/persuade the general population to drive safely (once again). 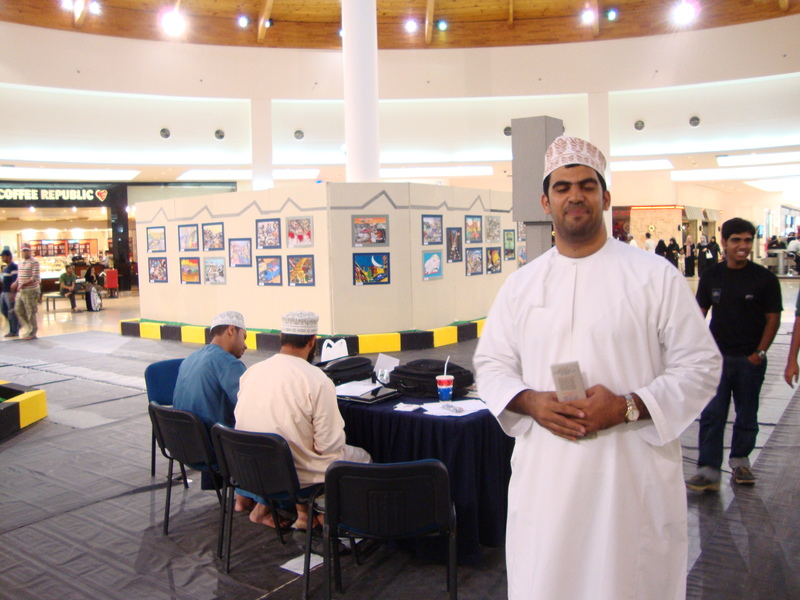 The gentleman pictured here, Yasser Mohammed, is an art teacher from the Batinah region of Oman. 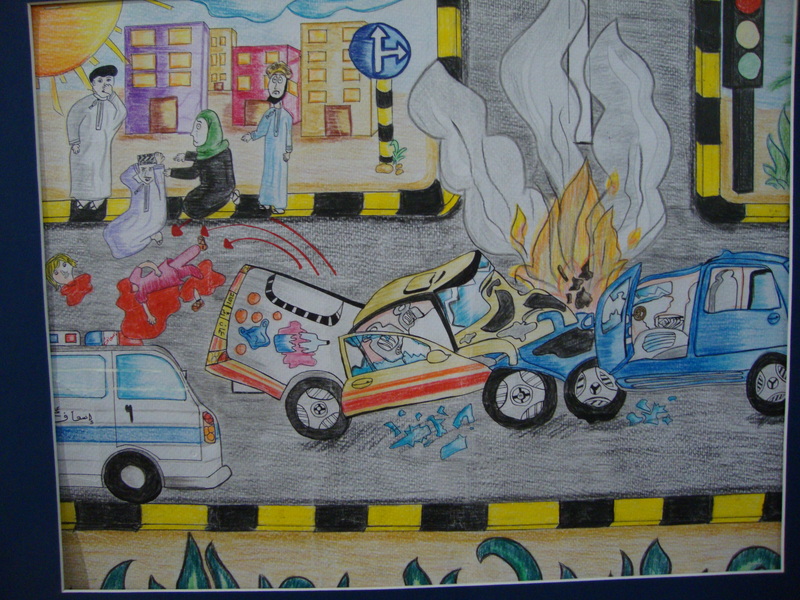 The campaign they are running is being held at the biggest mall in Muscat, City Centre, featuring drawings on road safety. 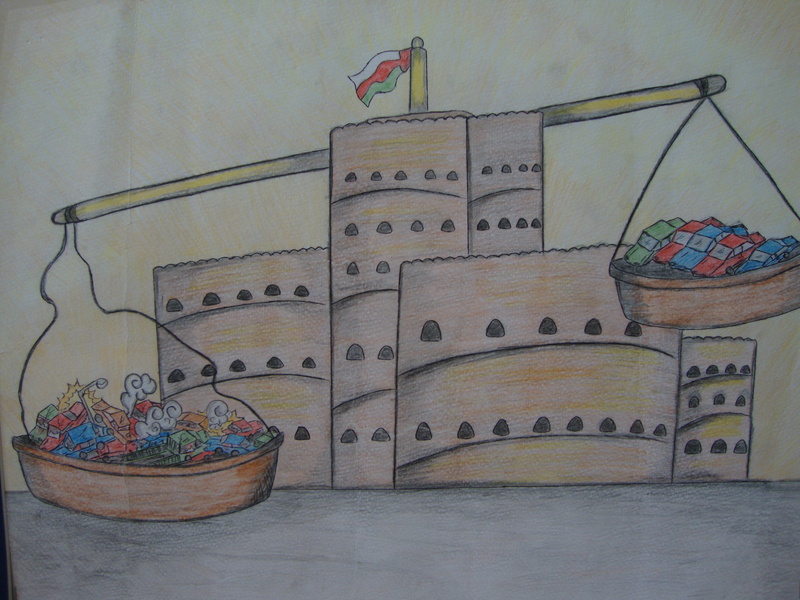 Omani school children (from Batinah) between the ages of 10 and 18 have sketched these drawings and they are pretty amazing and insightful. WARNING: even though they are only “drawings”, some of them are rather graphic with lots of blood and some even contain scenes of dismemberment! Okay…you’ve been warned! 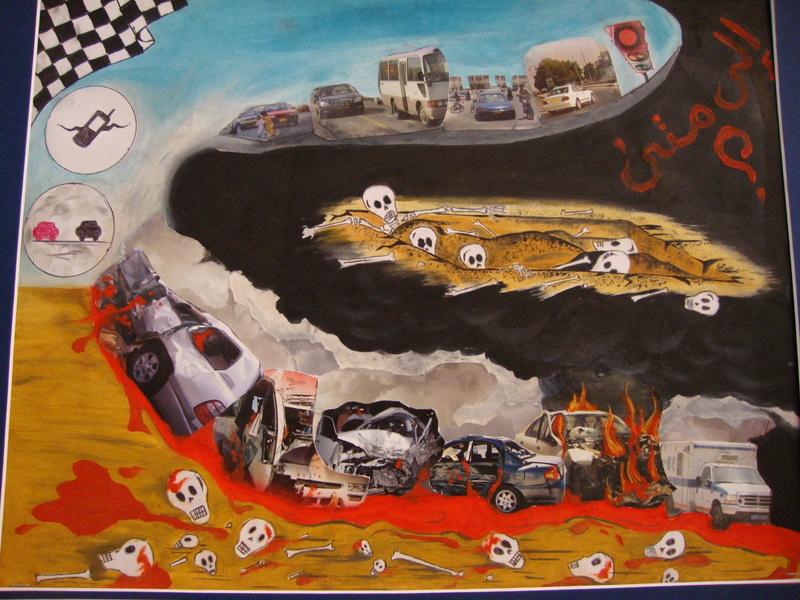 So here are what I thought to be some of the best drawings: According to the week magazine (www.theweek.co.om ), there were more than 100 accidents which saw 10 people killed and 150 injured in road accidents in the first week of January in the Sultanate of Oman. That included 62 collisions between vehicles and 27 collisions with a fixed oject. During the next week (Jan 9-15), there were 117 more accidents with an outcome of 15 dead and 132 injured! Notice the high-speed smoke and cell phone in the pic. Excessive speeding is one of the many causes of accidents here. What makes it worse (I think) is that tailgating is so common here. The ones speeding flash their lights and expect everyone to get out of their way! 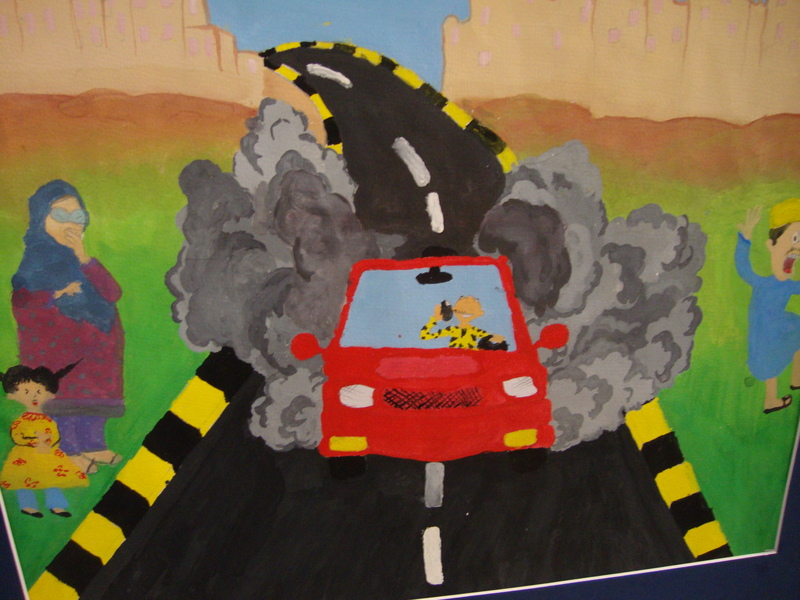 In addition, so many accidents seem to be caused by the use of cell-phones! 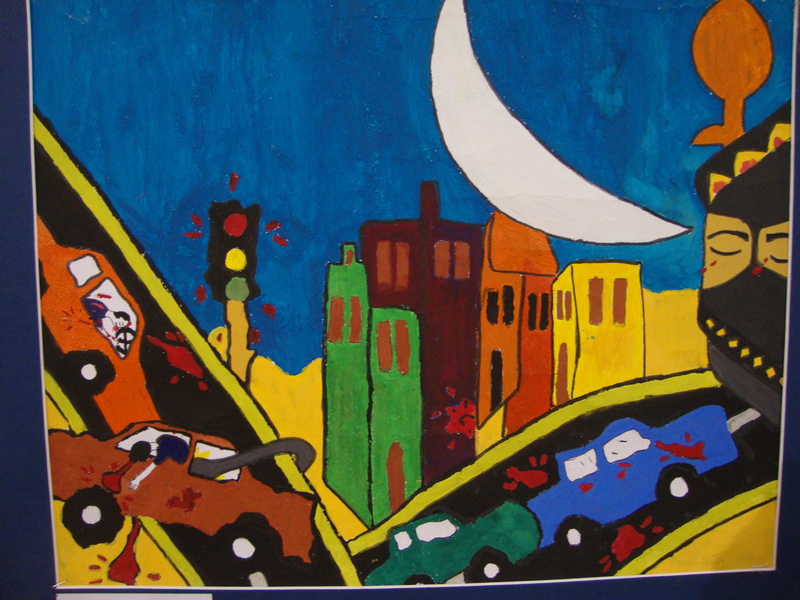 14 pedestrians were killed in Toronto, Canada, during the first 3 weeks of January, 2010. 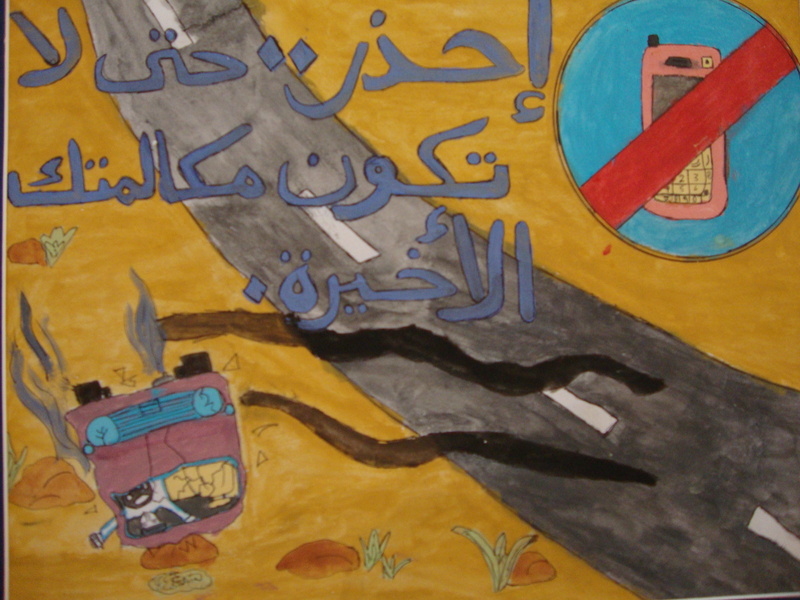 Most of those accidents were caused by cellphone distraction, either by the pedestrian or the driver. As a result, there will be a $500 fine for people caught using cellphones there. They are even considering banning the use of “hands free phone sets” because statistics show that it is not so much the cell-phone but the fact that people are engrossed in conversation which takes their attention off the road. 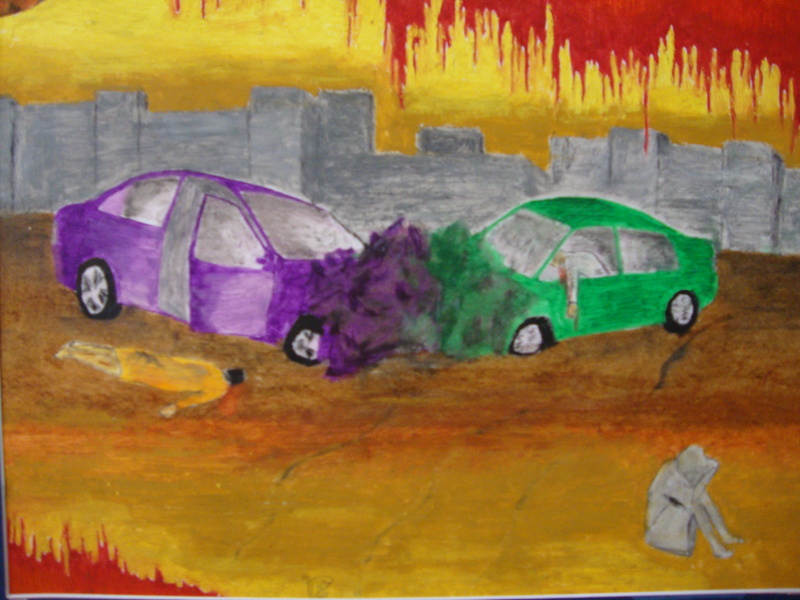 Some of these drawings are so insightful; they really express the hurt and pain caused by the loss of life and limb in car accidents. 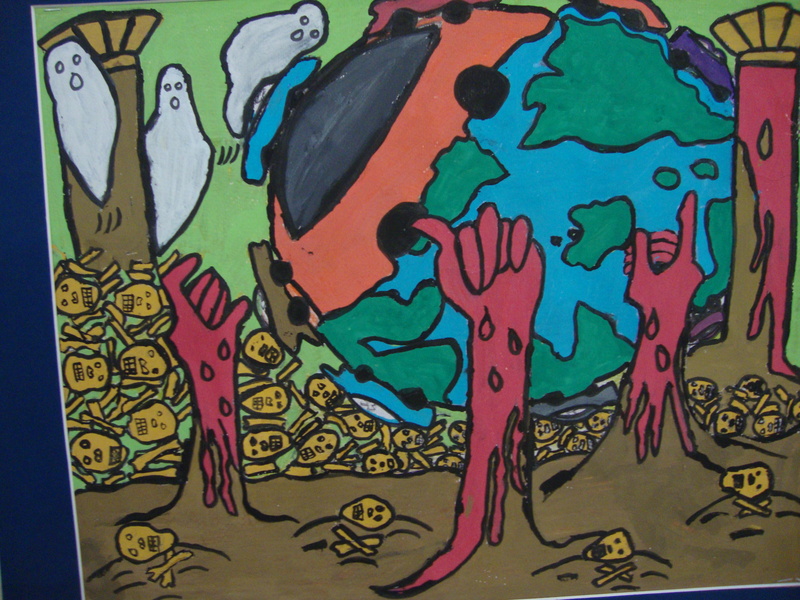 Some of the artwork, like this one, seems to be a short story or movie in itself. Here is an extremely helpful guide (it’s a powerpoint presentation) on driving in Oman published by PDO (Petroleum Development Oman). I would highly recommend any expat who drives or is thinking of driving in Oman to check this out! 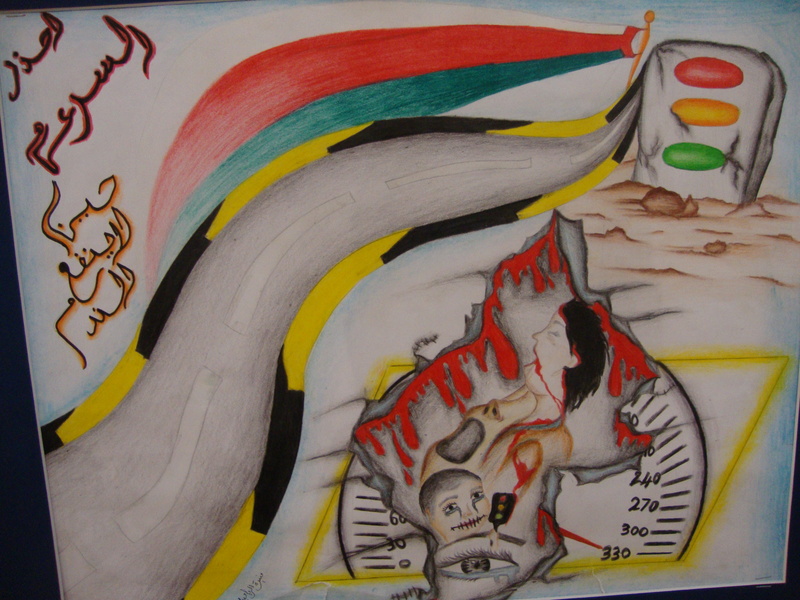 I agree wholeheartedly with their statement that, “Safety of people comes first, anything else comes second!“ There is Arabic in many of these drawings but language is often unnecessary. 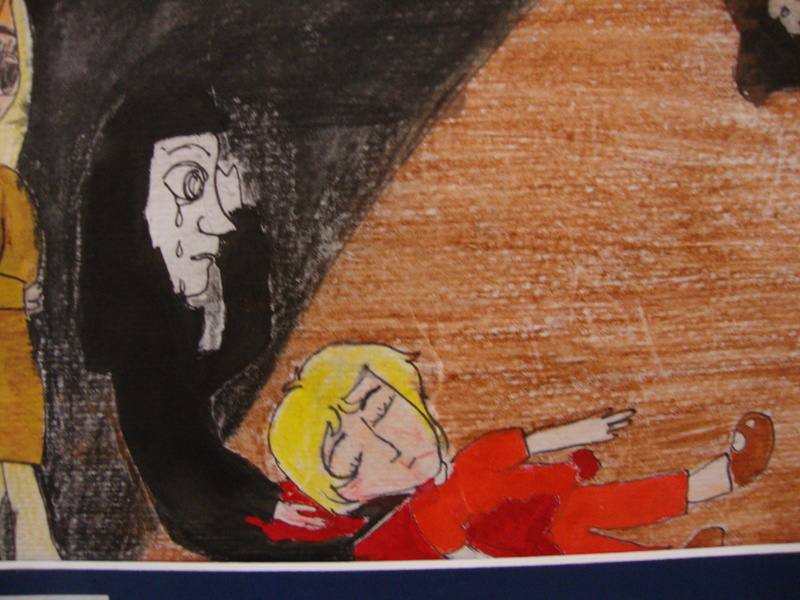 I can only imagine that this boy is crying, “Abba (Father), Father” as we notice the blackened portrait of a man on the wall in the background.” I wonder how many of the kids who did these paintings know someone who has been injured or killed in accidents. More than a few, I guess. “What is happening on our roads should be of everybody’s concern. 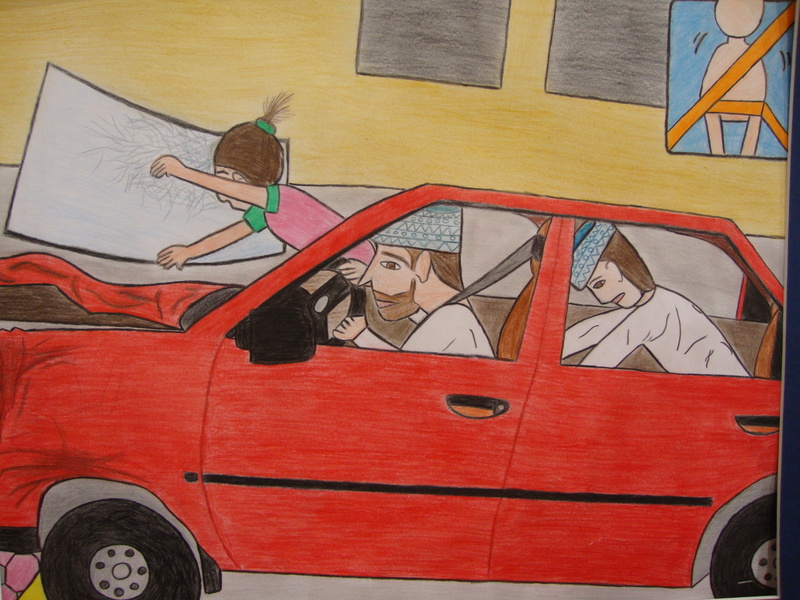 Misuse of vehicles of different categories by different people causing many deaths is an irritating and worrisome phenomenon.” (Sultan Qaboos Bin Said) Check out this nice website with vids and info on road safety and why kids seats are extremely important. 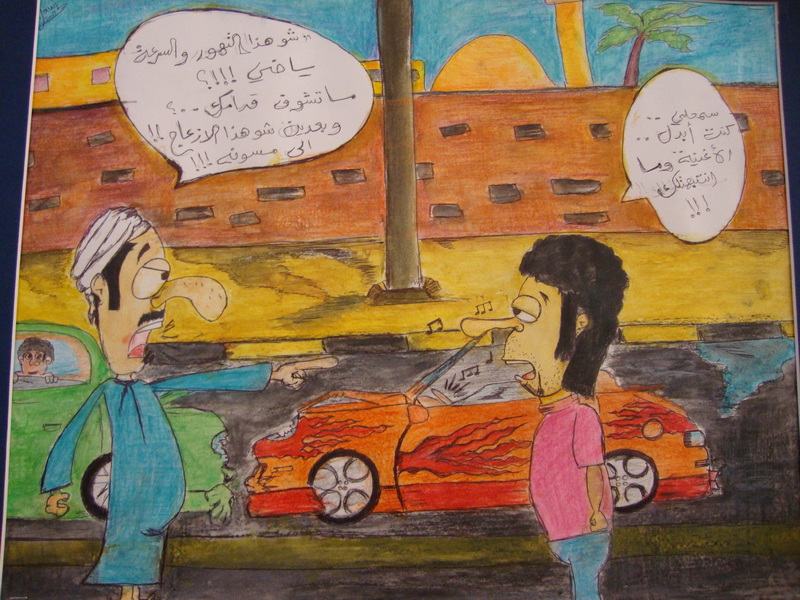 This picture seems to be of 2 men arguing about who is to blame for the accident. It would be awesome if someone could translate this for me! 🙂 This picture shows the sad reality that many parents here do not insist that their kids wear seatbelts. Kids can often be seen horsing around and jumping in the backs of cars or mothers holding infants on their laps in the front passenger seat. I really like this one. 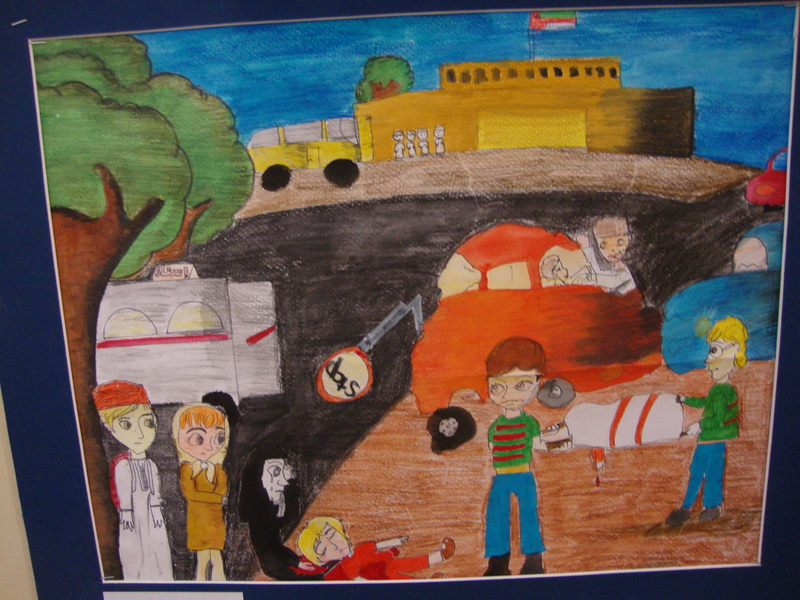 It’s like the kid wants us to weigh the consequences that accidents have on Oman. 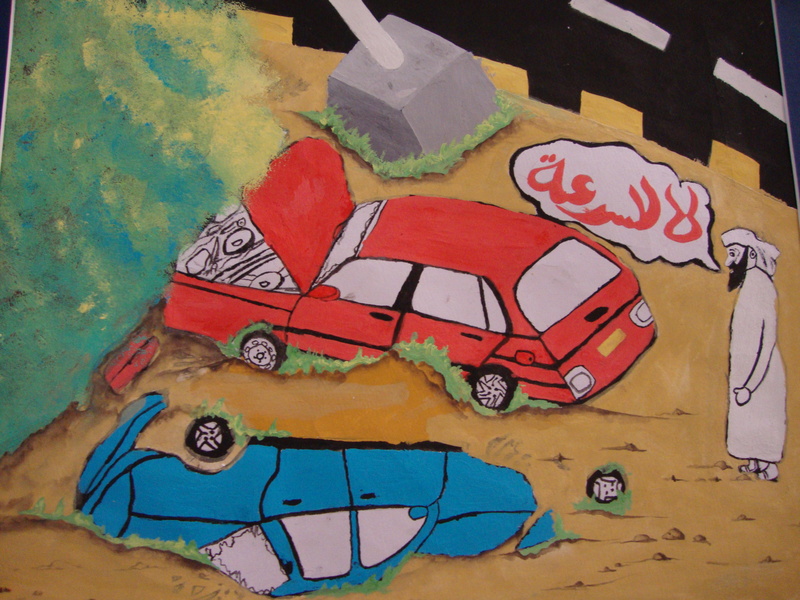 The picture above and the one below describe a dangerous scene that is a common occurence here in Oman during flashfloods. 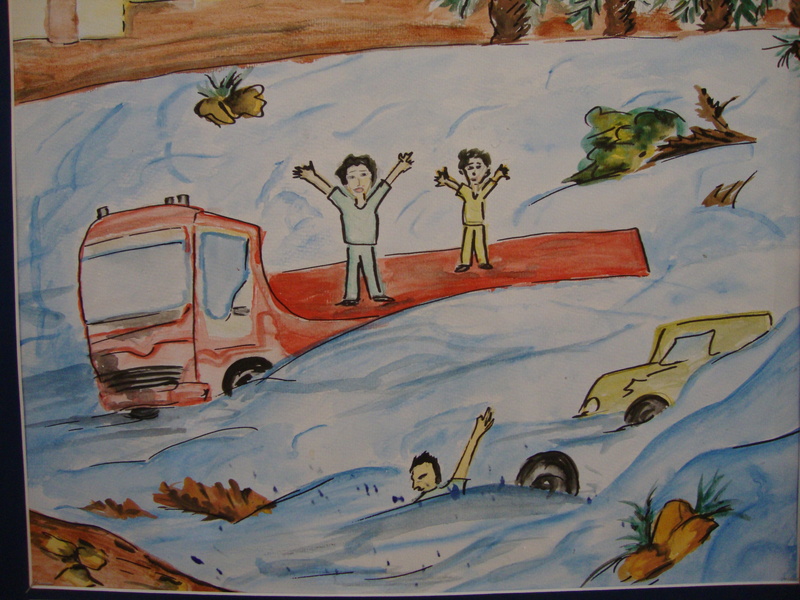 Impatient drivers often put their lives and the lives of those in the car with them at risk by attempting to cross deep wadis (valleys) overflowing with water. There are a few videos of such events on youtube. Here is one video. And another. And yet another. Finally, here’s one of a helicopter rescue video. 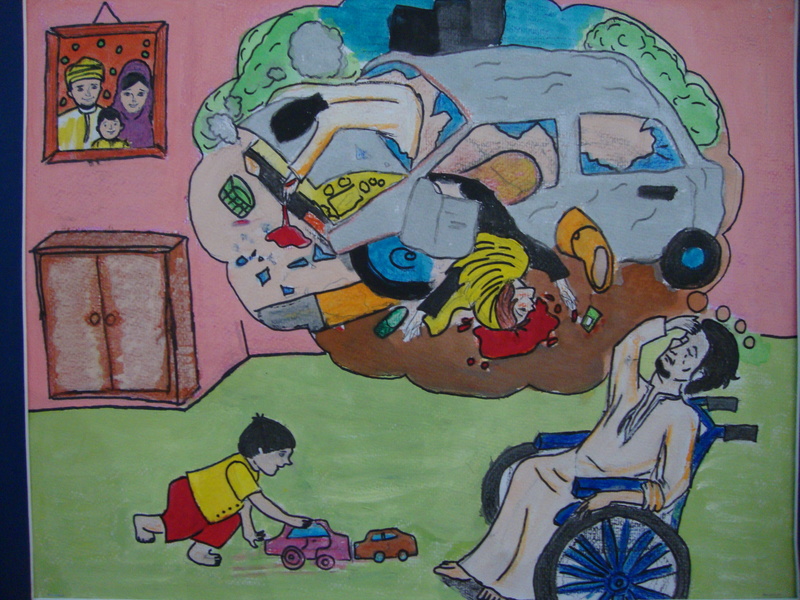 This picture really captures the heartbreak that accidents (oftentimes PREVENTABLE accidents) bring. 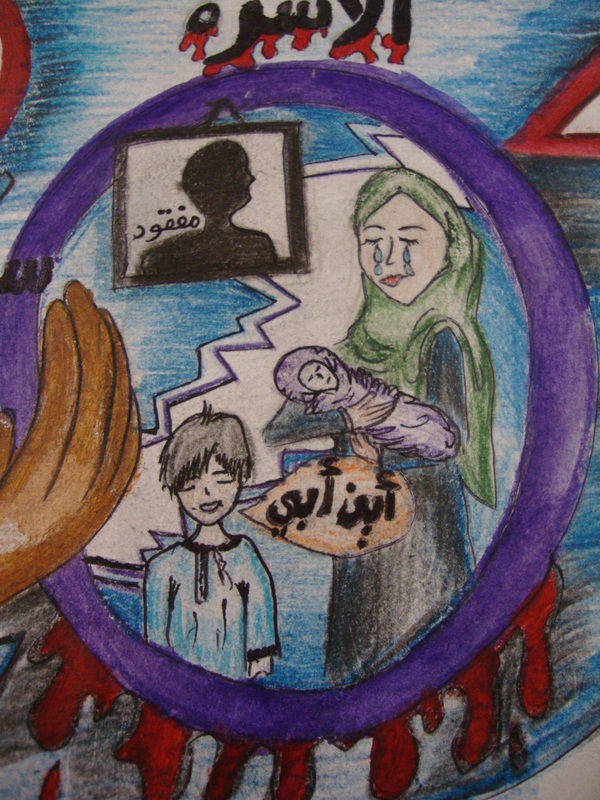 Here is a close-up of the above artpiece but focusing on the mother and her baby in the drawing. It really is sad knowing that such scenes are repeated time and time again, in reality, due to human error, misjudgment and neglect. Better to have blood on drawings (even if they do “shock” people) in order to get people to realize the sanctity of life than for blood to keep being spilt on the streets! Look at the face on the kid in the passenger’s seat. Priceless! 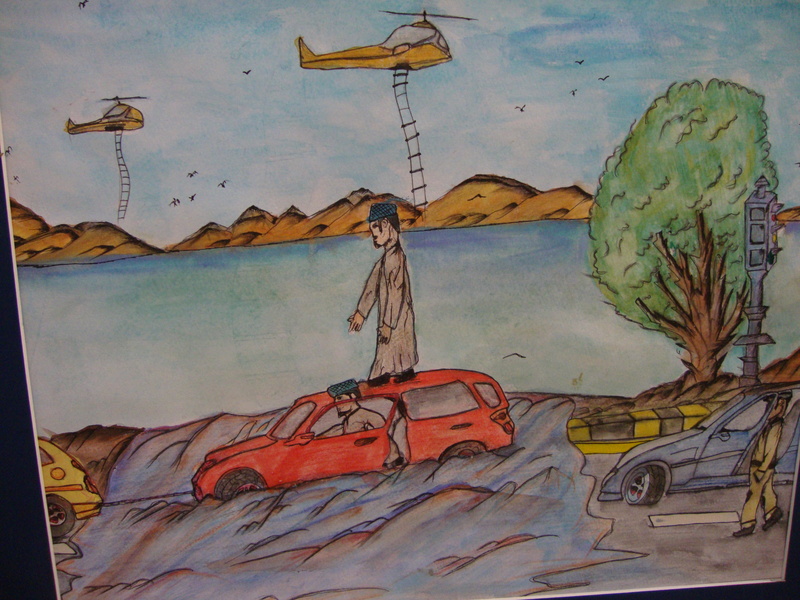 I like the fact that the police officer in this drawing is female. Many people (including myself when I first arrived!) are surprised to learn that there are quite a few ladies in the police force. Check out the smoke pouring out from the tires. 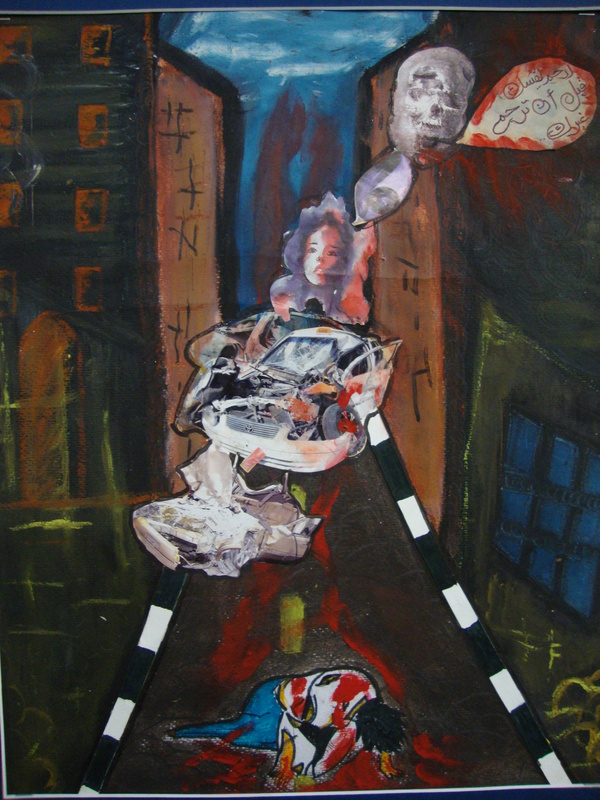 There were several smoking tire paintings in the collection. Young boys love peeling their tires down the road late at night and doing donuts after their favorite team wins some silly football match. Here are some videos again to show you this punkish-aren’t-I-so-cool-attitude which is so prevalent among many of the young men here: vid 1, vid 2 (the sad thing is hearing the people encouraging this behavior with their cheering! ), vid 3, vid 4. This stuff REALLY makes my blood boil as no amount of education can change a proud spirit which is only out for attention or self-interest. So which of the paintings do you “like” most? 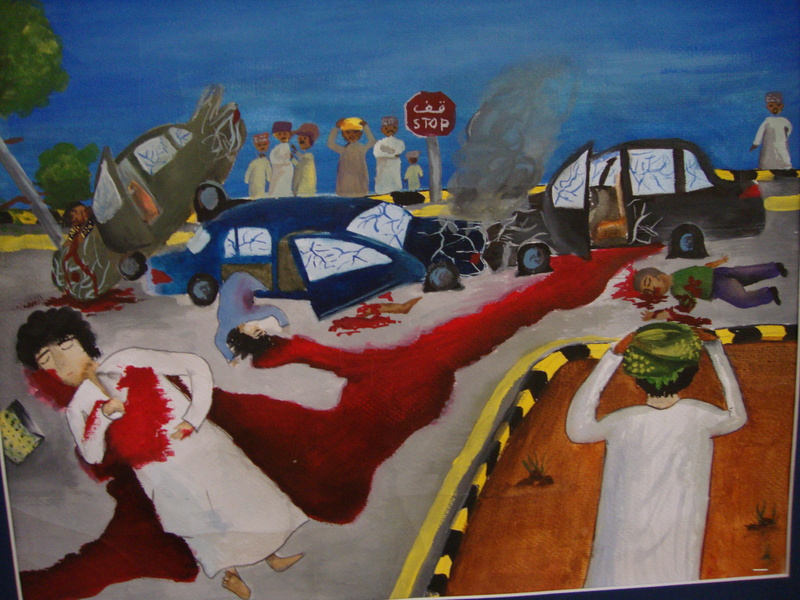 If you live in Muscat, try to make it down to City Centre and check the rest of the paintings out. 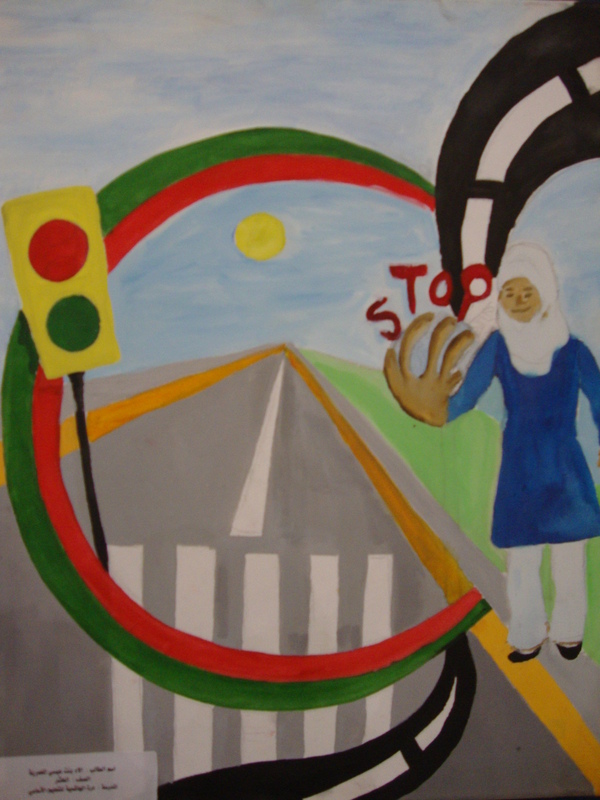 Let these drawings, by some very talented young Omani kids, speak to your heart and hopefully as a result, allow you/us to take road safety more seriously. Above all, DRIVE SAFELY out there!!! 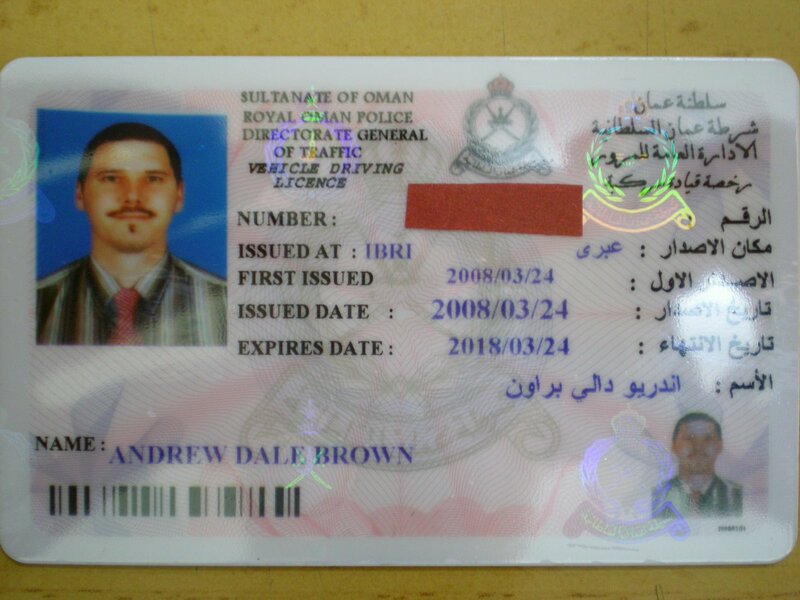 -After sending a college driver to the consulate to verify license papers from Canada (which cost 24 RO + 10 RO for the driver)-And after much additional, unnecessary waiting and worrying….TADA!!! This sucker is valid for 10 YEARS!